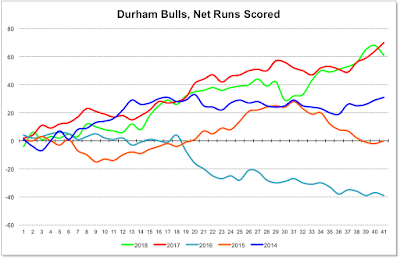 Watching Durham Bulls Baseball: Durham Bulls at Game 41; Charts! This was a very successful homestand. The Bulls won 5 out of 6 games (and they've won 10 of their last 13). They are off to Gwinnett for four games and then go from there to Louisville for four more. That's 8 games on the road just to keep them out of the DBAP while the ACC tournament is going on. They are 3½ games ahead of Norfolk in the South Division. 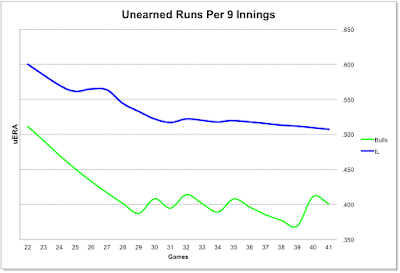 Net runs scored is a pretty good indicator of them performance. 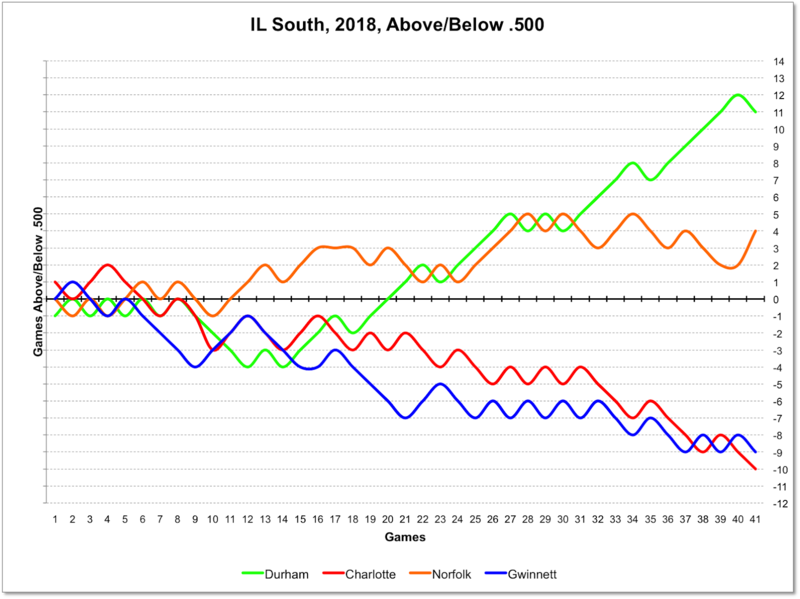 By that indicator, at 41 games into the season, this is a very good Bulls team. 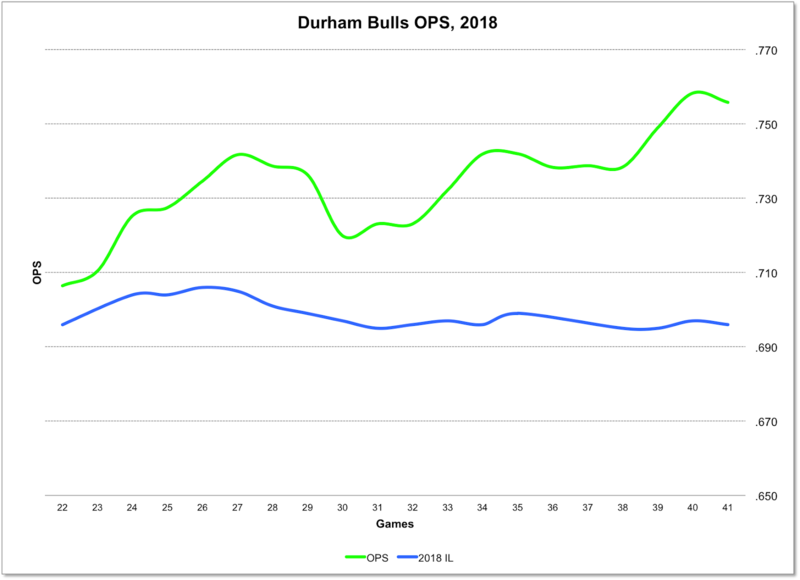 The Bulls have the second-best team ERA in the International League. The starters and relievers are holding about even, which is a change from previous years. 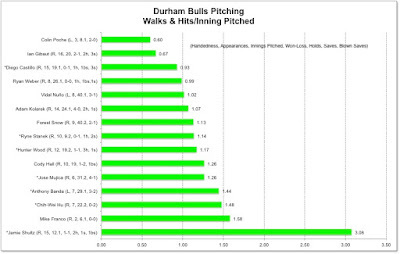 Typically, the Durham Bulls relief crew does much better than the starters. 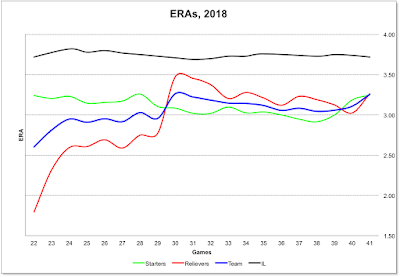 But this is getting harder to sort out with the number of bullpen days, and the erratic performance on a couple of the starters. 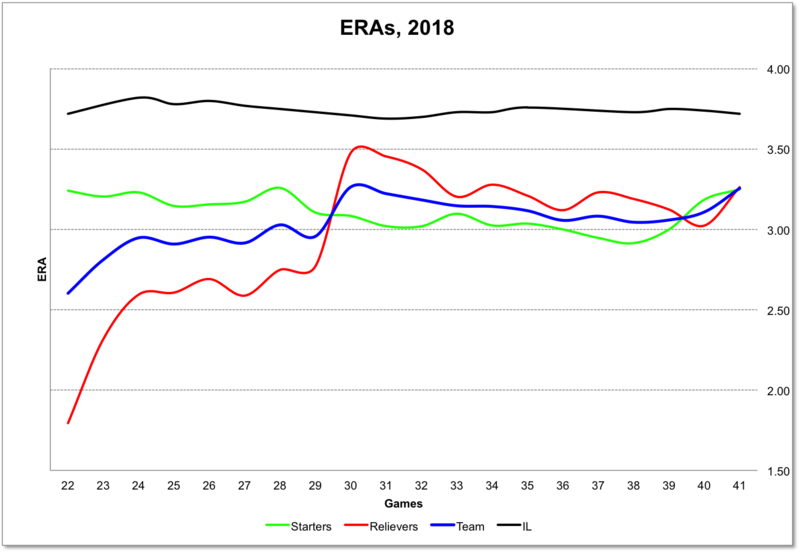 For example, if we look at the WHIP numbers for all of the pitchers we see that three of the starters simply aren't putting up very good numbers. One of them, Chih-Wei Hu, is enduring another year where the Rays don't seem to know how they want to use him. The biggest concern among the pitching crew is reliever Jaimie Schultz. He's had 8 appearances in May, but has just completed 6⅓ innings giving up 16 hits (2 homers), 9 walks, and 14 earned runs. We remember him as a decent starting pitcher back in 2016, but we have to admit that we're worried now. On the positive side: the Bulls have a bunch of pitchers near the golden number of "1". Please also note that pitchers on the 40-man (marked by an *) are very often "working" on something which can mean that their stats don't necessarily reflect their value to the Rays. 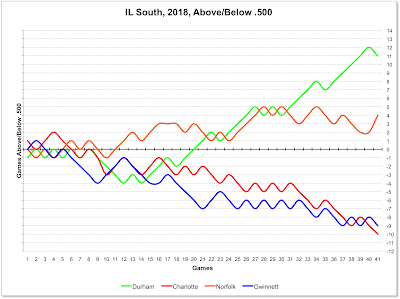 Also, this is very early in the season. Small sample size cautions apply. In most years Bulls hitters are in the middle of the pack. Not this year. 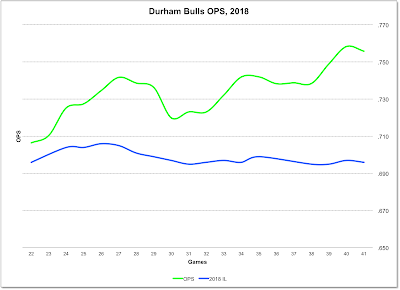 A team OPS of .756 is very good and rates at 4th in the International League. 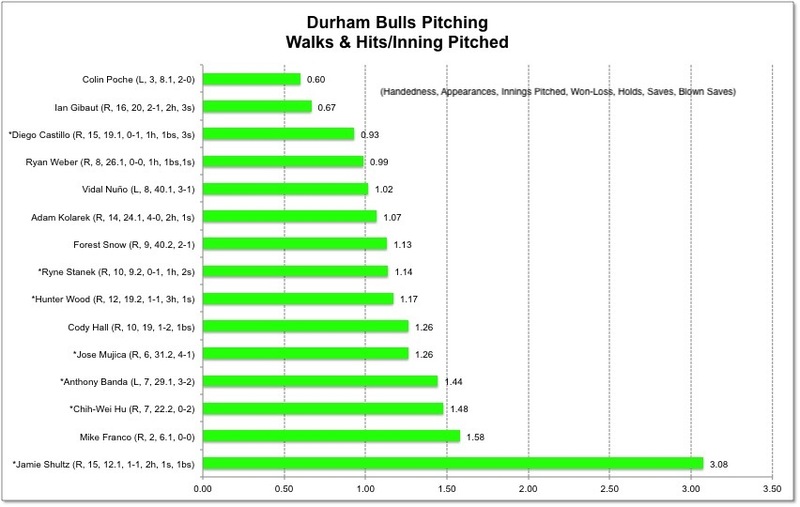 Durham Bulls hitters, sorted by OPS. Individually, Kean Wong stands out. Curt Casali is only playing in half the games, yet has impressive numbers. Andrew Velazquez's 11 stolen bases have been really fun to watch. 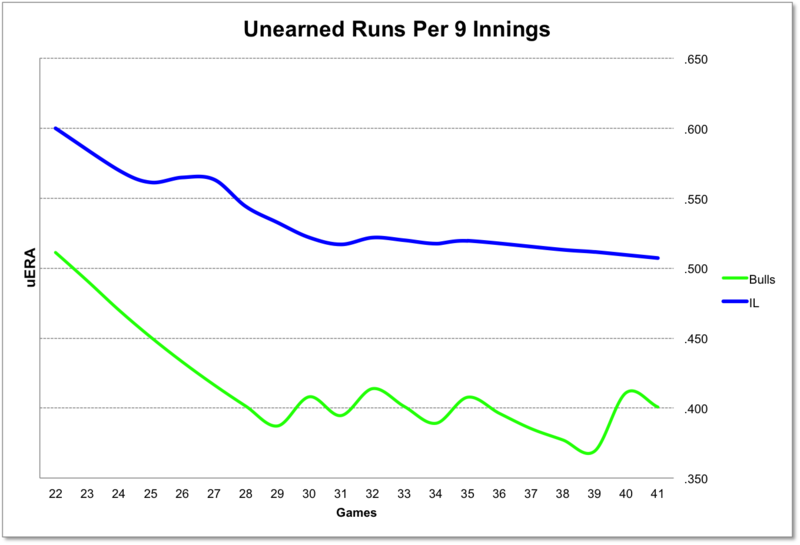 Lastly, here's our home-grown defensive measure, Unearned Run Average (unearned runs per 9 innings), which is the mirror-image of ERA. Looking good!